SAMPLE SOUND REVIEW: 70% Off Winds of Awesomeness Bundle by Embertone - Limited Time - Sample Library Deal !! 70% Off Winds of Awesomeness Bundle by Embertone - Limited Time - Sample Library Deal !! 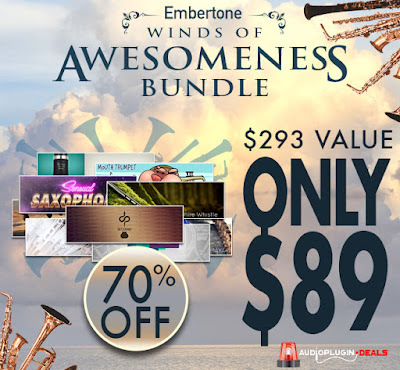 For just $89, get the amazing Winds of Awesomeness bundle by Embertone. Regular price $293 ! This vast collection of winds libraries built for the full retail version of Kontakt comes with over 14,000 samples! Save over $200 on this amazing deal which ends soon, don't be late to the party! Full vibrato and dynamic control Requires full version of Kontakt.